Series of evolutionary changes take place. these can be seen in the body plans in the animal kingdom and the protists. Evolutionary changes do not always mean progress and increased complexity. Evolution also caused degeneration. It also produces useless structures. Evolution often produce dead end. The path of evolution in animal is very difficult. The Evolutionary path does not show evolutionary sequence. The arrangement of parts of an animal around a point or an axis is called symmetry. There is diverse organization in the bodies of animals. However, certain patterns of organization are present within this diversity. The concept of symmetry is, fundamental for understanding animal organization. 1. Asymmetry: The absence of a central point or axis around which body parts are equally distributed is called asymmetry. For example, sponges. Asymmetry is not an adaptation. It gives no advantage to an organism. Asymmetrical organisms do not develop complex communication, sensory, or locomotory functions. However, the protists with asymmetry have flourished. 2. Radial symmetry: The arrangement of body parts in which plane passing through the central oral-aboral axis divides the animal into mirror images is called radial symmetry. For example. sea anemone. A sea anemone can move slowly. It is most sedentary animal. The sensory and feeding structures are uniformly distributed around its body. Sea anemones do not have distinct head and tail ends. One end of the animal possesses mouth. It is called oral end. The opposite end of the mouth is called aboral end. Ittere are certain arrangements in the radial symmetry of animals. (a) Biradial symmetry: The paired arrangement of some structures in radially symmetrical animals is called biradial symmetry. Radial symmetry is often modified by the arrangement of some structures in pairs, or in other combinations. These structures are present around the central oral-aboral axis. (b) Pentaradial symmetry. : The arrangement of structures in fives around a radial animal is called pentaradial symmetry. The sensory, feeding and locomotory structures are not simple in radially symmetrical animals. The evolution of such complex structures in radially symmetrical animals require repeated distribution of specialized structures around the animals. (a) Anterior end with head: The bilateral animals move primarily in one direction. Therefore, one end of the animal is continually encountering the environment. It is called anterior end. 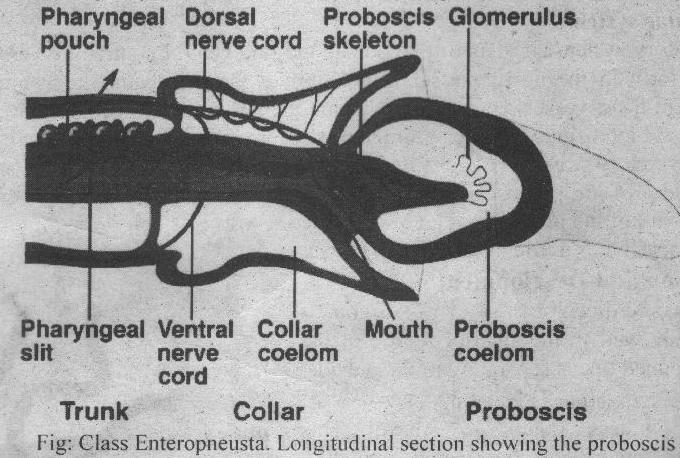 The anterior end has complex sensory, nervous, and feeding structures. These developments result in the formation of a distinct head. The formation of head and concentration of sense organs in it is called cephalization. Celphalization occurs at an animal’s anterior end. (b) Posterior or tail end: The end opposite to the anterior end is called posterior end. 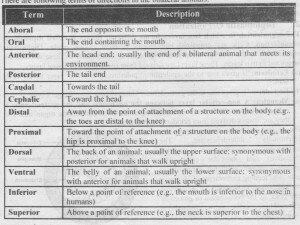 Theposterior end has animal’s tail end. 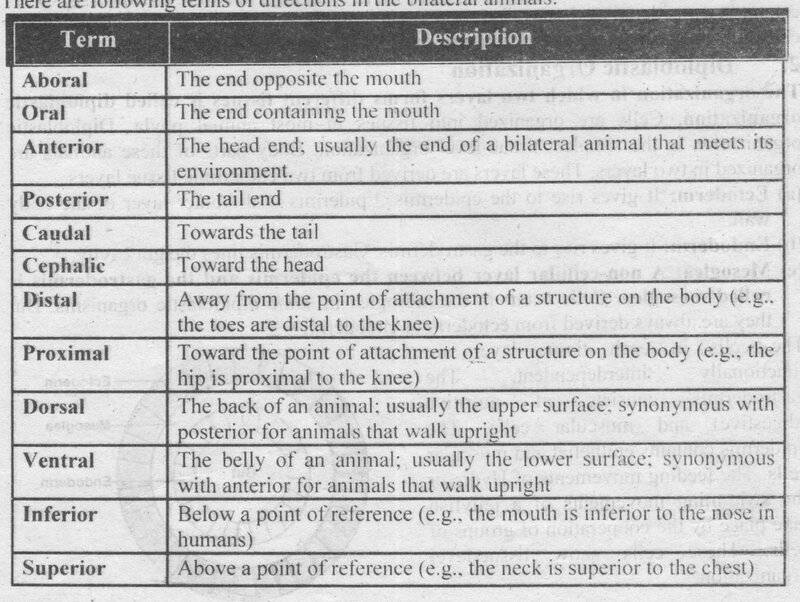 Other important terms of direction and terms describing body planes and sections apply to bilateral animals.